We have two kinds right now there are the Sap Suckers and the Pileated Wood pecker. I love the red crown on them. 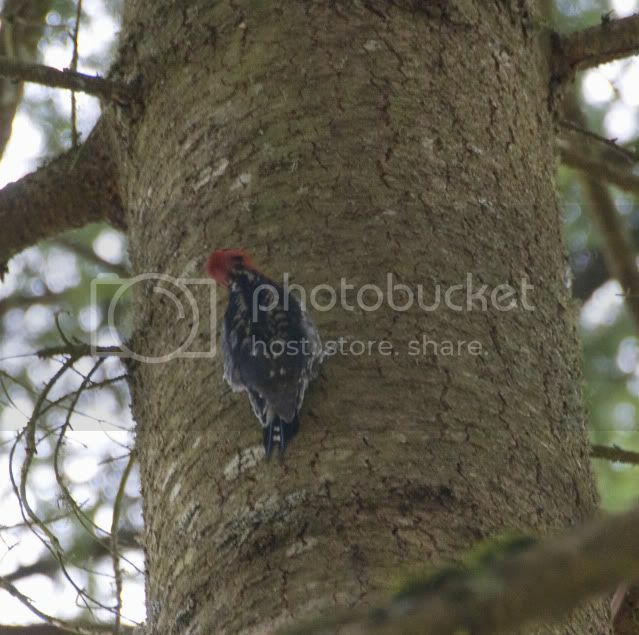 The pileated Wood Pecker looks like Woody Wood Pecker and is a big bird. They are supposed to be very rare but we have them near the house and they come back every year. I was out side and stood real still, the Pileated wood pecker came real close to me and I just hung out looking at it, I wish I had my camera on me as we were so close. Every year I continue to be amazed at the numbers and varieties of birds which frequent our yard. I think that it may be related to the fact that we have very tall trees, lots of medium height trees and shrubs, open fields, mixed forest and pine forests, as well as available water.. Each of those vertical levels, as well as the different mix of vegetation likely contributes to the wide mix of birds. We have at least a half dozen varieties of wood peckers. We occasionally see the pileated woodpecker. The red headed and the red bellied are two of the most frequent visitors. Then there are two or three of the smaller species like the downy or the hairy. The red headed have nested in the old oak trees in our yard for a number of years. Every year we have blue birds, summer tanager, flycatchers, chimney swifts, purple martins, blue jays, cardinals, gold finches, robins, sparrows, wrens, chickadees, mockingbirds, thrashers, catbirds, gnatcatchers, nuthatch, titmice, various black birds, hawks, owls (though rarely visible, doves, kingbirds, hummingbirds, and for sure many others that I've not identified. The area around our home is a bird watcher's paradise and we love it! Cool Alex; I keep a bird book handy. I saw a turkey vulture today. Good Photo !Now you know where "woody" got his laugh! Woodpeckers are very common around here. A little downy was busy drumming on our maple tree this spring, but has been quiet lately, so he must have found a mate. We also see flickers, red bellied, red headed and in my father-in-law's woods, pileated. There is something about watching birds that fascinates people!Lucky are the people that have great habitat near their home. For those near Ohio, try Magee Marsh (part of Crane Creek) near Oak Harbor in the spring for the Big Fly, where warblers and other birds stop and rest during migration. Usually happens around Mother's Day. The town I live in is named Eagle Creek, I think they are way cool birds.